I can’t sit here and type with a straight face that Shooters are underrepresented on the indie channel. Hear that, I was just laughing. The short of it is, you could throw out a Bing search on the Xbox dashboard and get more results than you could handle before the ‘Sh…‘ sound leaves your lips, ending in ‘…it! That’s a lot!’. Although a smaller sub-genre, the marketplace isn’t hurting for Bullet Hell(s) either, but Birth Order (80 MSP) attempts some out-of-the-hit-box thinking. Rather than a traditional, numbered stage progression, advancement is handled via a grid-like game board, with you choosing a route (from a handful of repeated stage themes— City, Forest, etc.) towards the final boss, locked away at a seemingly safe distance. Bonus-granting cards earned in-game give you various powers (extra firepower, sidekicks) to use between levels and that last the duration of a stage, which is a unique touch, and adds some strategy to your chess moves (Hint: save ‘shield’ cards for later battles). Also novel is the ‘shooting’ itself. ‘Just Press B. It’s easy.’ Lies I told myself. All of your shots are homing. An enemy’s weakness is visibly mapped to the face buttons. Match to kill. Sounds cut and dry, and it is, to an extent. See, there will be bullets. Lots of bullets. 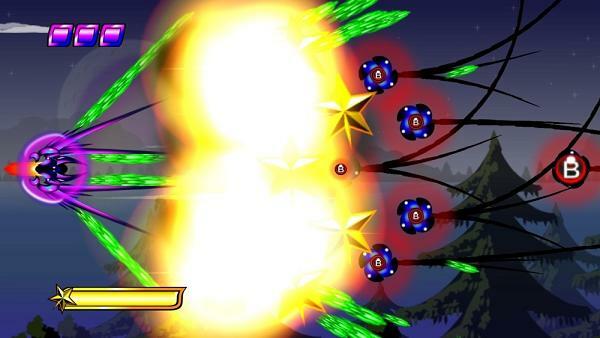 The pink variety can be converted into stars (the game’s energy currency) upon an enemy’s death, but other shots you’ll have to avoid amid a multicolored-chaos without end. I can’t stress enough the importance of having threat-assessing eyes. There’s the Quick, and then there’s the Leo… eh, you know the saying. And don’t expect any mercy from the start. If you’re not paying attention, the first stage will kill you immediately after the introductory handshake. It’s not a Bullet Hell in the traditional sense. You’re not learning shot patterns through repetitious death; you’re just getting lucky after repetitious death. And therein lies the caveat, if you’re the type that goes looking for caveats. There’s a degree of chance at play here. While you will certainly improve at Birth Order and its enemy recognition over time (via that pesky death part), sometimes success will be had purely through the luck of the draw, either in the aforementioned perk cards or extra lives found on the world / game board. Birth Order is short on playtime (my routes through the game ran about 25 minutes each), and the only nudge towards replaying it is to see where the chips may fall / if Lady Luck is on your side this round, but for the buck it’ll run you, it’s worth it to step outside the usual XBLIG shooter comfort zone. Yes, chance might be Birth Order’s biggest failing. I’ve got better at the game with practice, but even now I can still be wiped out on the first level if I get a rough draw. By the way, do you know what the stars actually do? I’ve never been able to work out what effect, if any, they have. It’s all luck. 😉 I labored forever to get a good draw / extra lives run. As for the stars, hmmm, put me on the spot with that one. From the game’s explanation, stars give you more power. I noticed the meter in the bottom left, and then on the board, it shows your experience level and total XP, XP to next level, so I’m assuming higher the level, the more powerful your shots? I never noticed anything different at higher levels, curiously. Yeah, I noticed that the level bar goes up but never detected a noticeable change in performance. Hmmm. Better than my previous thought, that it built up and gave me those star cards once I was back on the game board, although what the added XP meant, I didn’t know. Mystery solved.